Beauty review : which lipstick to wear to office? Liquid lipsticks are in vogue right now. Ever wondered which lipstick to use for office wear? Many brands have launched their variety of liquid lipstick. 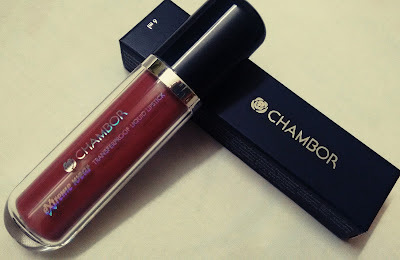 Beauty review of Chambor transfer proof Extreme Wear Liquid Lipstick. I often wear this brand liquid lipstick, got lot of compliments for keeping fresh professional look. Please find below the precise review. Packaging: It has unique packaging.This product comes in a glass tube like you can can see in the image above. It is transparent so one can see liquid lipstick clearly. Application: It gives a full coverage look to the lips.The application of this product is smooth, however after application it tends to dry the lips. Tip would be to apply lip balm before applying this lipstick. Colours: Available in variety of colours from dark shades to pinks. The colour is highly pigmented and gives a smooth effect. Texture: The texture is smooth velvety, creamy liquid consistency. Lasts: it does last long for 6 hours and needs only one time reapplication. Final verdict: i will be buying this product as it is good for office wear, gives super matte finish look.